پودر هیدروکسی آپاتیت دارای منیزیم به روش شیمی تر و با استفاده از پیش ماده های نیترات کلسیم، نیترات منیزیم و دی آمونیوم هیدروژن فسفات در حضور اسید گلوتامیک سنتز شد. بر اساس یافته های حاصل از تحلیل حرارتی، نمونه ها در دماهای مشخص کلسینه شده و به روش های پراش پرتو ایکس، اسپکتروسکوپی مادون قرمز با انتقال فوریه و میکروسکوپ الکترونی عبوری مورد مطالعه قرارگرفتند. 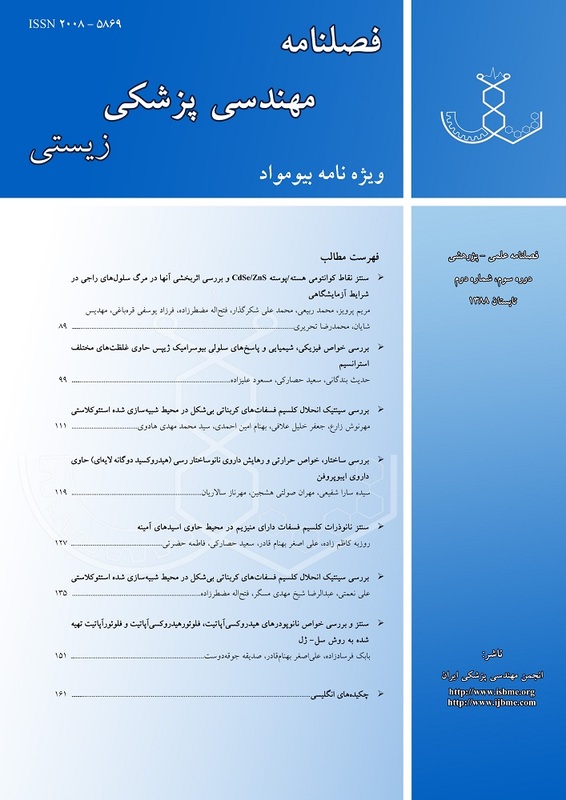 نتایج پراش پرتو ایکس نمونه سنتز شده در حضور اسید آلی نشان دهنده غالب بودن فاز (b-TCMP ((Ca1-xMgx) 3 (PO4) 2 در دمای 920oC است. هیچ قله مشخصی از فاز هیدروکسی آپاتیت در این دما شناسایی نشده است. این در حالیست که نمونه سنتز شده در غیاب اسید آمینه (نمونه شاهد) در این دما دارای هر دو فاز هیدروکسی آپاتیت و b-TCP است. از یافته های قابل توجه در این تحقیق کاهش شدید درجه بلورینگی نمونه های سنتز شده در دمای 90oC در اثر اضافه نمودن اسید گلوتامیک است. افزایش درجه بلورینگی نمونه سنتز شده در حضور اسید آمینه با افزایش دمای عملیات حرارتی بسیار بیشتر از نمونه شاهد است. بررسی های میکروسکوپ الکترونی عبوری روی نمونه های عملیات حرارتی شده در دمای 480oC نشان داد که استفاده از اسید گلوتامیک بیش از آنکه بر کشیده شدن کریستالیت ها اثر بگذارد بر کوچک شدن آنها موثر بوده است. ابعاد نانوذرات تهیه شده در حضور اسید آمینه بر اساس مشاهدات میکروسکوپی حدود 60*150 nmو در نمونه شاهد حدود nm 150*500 است. اندازه کریستالیت های تخمین زده شده با استفاده از رابطه شرر در نمونه شاهد حدود 40 nm بوده ولی به دلیل درجه بلورینگی اندک، در مورد نمونه های سنتز شده در حضور اسید آلی قابل محاسبه نیست. Magnesium-contained Hydroxyapatite Nano powder was synthesized by wet chemical method using calcium nitrate tetra hydrate, magnesium nitrate hexa hydrate and di ammonium hydrogen phosphate in the presence of Glutamic acid. According to thermal analysis (STA) findings the samples were calcinated at specific temperatures and characterized by XRD, FTIR and TEM analysis. XRD results showed the that b-TCP ((Ca1-xMgx)3(PO4)2) was the dominant phase at 920°C. No characteristic peaks of hydroxyapatite were observed at that temperature. In contrast, the sample which was synthesized in the absence of Glutamic acid, contained both hydroxyapatite and b-TCP phase. The Findings showed a rapid decline in degree of crystallinity at 90°C with presence of Glutamic acid in reaction media. Transmission electron microscopy (TEM) observations on heat treated samples at 480°C revealed that using Glutamic acid has noticeable effect on crystallite size instead of its growth orientation. Dimensions of biomimetic nanoparticles as observed by TEM were 150x60nm and in the witness sample was 500x150nm. According to Scherrer formula for crystallite size, the size of the witness sample was calculated about 40nm. However, because of low degree of crystallinity it was impossible to calculate the size of Glutamic contained samples. Lee D., Sfeir C., Kumta P.N., Novel in-situ synthesis and characterization of nanostructured magnesium substituted β tricalcium phosphate (β-TCMP); Materials Science and Engineering, 2009; 29: 69–77. Bianco A., Cacciotti I., Lombardi M., Thermal stability and sintering behavior of hydroxyapatite nanopowders; Thermal Analysis and Calorimetry, 2007; 88: 237– 243. Landi E., Logroscino G., Proietti L., Tampieri A., Biomimetic Mg-substituted hydroxyapatite: from synthesis to in vivo behavior; Mater Sci: Mater Med, 2008; 19:239–247. Kannan S., Lemos I.A.F., Rocha J.H.G., Ferreira J.M.F., Synthesis and characterization of magnesium substituted biphasic mixtures of controlled hydroxyapatite/β-tricalcium phosphate ratios; Solid State Chemistry, 2005; 178: 3190–3196. Gray C., The Cyborg Handbook; Routledge New York; 2003, 12-16. Benyus J., Biomimicry: Innovation Inspired by Nature; Harper Perennial, New York, 2006, 212- 223. Zhang W., Huang Z.L., Nucleation Sites of Calcium Phosphate Crystals during Collagen Mineralization; Biomaterials Laboratory. J. Am. Ceram Soc, 2000; 86: 1052–54. Matsumoto T., Okazaki M., Inoue M., Hamada Y., Crystallinity and solubility characteristics of hydroxyapatite adsorbed amino acid; Biomaterials, 2002; 23: 2241–2247. McQuire R., Ching J., Vignaud E., Lebugle A., Synthesis and characterization of amino acidfunctionalized hydroxyapatite nanorods; J. Materials Chemistry, 2004; 14: 277–2281. Cacciotti I., Bianco A., Lombardi M., Mg-substituted hydroxyapatite nanopowders: Synthesis, thermal stability and sintering behavior; J of the European Ceramic Society, 2008; 29: 2969–2978. Suchaneka W.L. ; Byrappaa K.; Shuk P.; Preparation of magnesium-substituted hydroxyapatite powders by the mechanochemical–hydrothermal method, Biomaterials, 2004; 25: 4647–4657. Marchi J., Dantas A.C.S., Greil P., Influence of Mgsubstitution on the physicochemical properties of calcium phosphate powders, Materials Research Bulletin, 2007; 42: 1040– 1050. Boanini E., Fini M., Gazzano M., Bigi A., Hydroxyapatite Nanocrystals Modified with Acidic Amino Acids; Eur. J. Inorg. Chem, 2006: 4821–4826. Chirantha R., Synthesis and characterization of strontium Fluorapatite; Departement of Chemistry College of Sciences, Graduate College University of Nevada, Las Vegas, Augest 2005. Aßmanna S., Viertelhaus M., Heiß A., Hoetzer K.A., The influence of amino acids on the biomineralization of hydroxyapatite in Gelatin; Journal of Inorganic Biochemistry, 2002; 91: 481–486.